Note to self: do not download free Kindle books from Amazon. These books are free for a reason and that reason is that very few people would willingly pay to read this garbage. I think the author meant well when she tried to combine cheese read chick lit with contemporary Christian fiction. She probably figured that the blending of the two genres would bring more readers to Fools Rush In, which to my dismay, is the first book in a series! Ugh! When I downloaded this book to my phone, I thought "Yay! Free read!" No where in the description did I read anything about this being a Christian novel, but I quickly figured it out with the scripture references, Bible reading in bed, and the constant prayers by all characters involved. This didn't bother me all that much, but I could see where it would piss off a lot of readers and make them put the book down. Not me though. I plugged on. I met and followed the lives of the most flat and stereotypical characters in chick lit. Bella Rossi is the ugly Italian daughter in a large, extended Italian family that eats a lot and owns a pizza parlor. The family has mob connections from their time living in New Jersey, which was before they moved to Galveston Island, Texas where this atrocious story takes place. Bella the ugly duckling grew up Methodist in Texas and knows nothing about cowboy boots or country music. Really? You mean to tell me that she never went to a high school dance or to a shopping mall? I'm sure cowboy boots and country music are known by all Texans, even if they don't like either one of them. Oh and the mobster's bird is named Guido? Really? What is this? The Christian Jersey Shore? Bella, the shallow and stereotypical protagonist, is responsible for her family's wedding facility, which she constantly refers to as the wedding facility. It wore on my nerves. She thinks themed weddings are her ticket to making the facility she named "Club Wed" a success. Her first wedding is a boot scooting country wedding, but, as we all now know, she knows nothing about country music or boot scooting. She needs to find a DJ to play the country music she knows nothing about and ends up hiring a guy named DJ instead. Enter Bella's love interest, DJ. He's a country cowboy with baby blue eyes. Oh how she loved looking into his baby blues. Oh how her heart melted when she looked into his baby blues. Oh how her stomach fluttered when she looked into his baby blues! I just vomited in my mouth a little just recounting the dozens of times DJ's eyes were referred to as baby blues. Can we be anymore cliched? Oh yes, we can! DJ's brother's name is Bubba and he makes barbecue. I couldn't make up crap this bad. Bubba ends up wooing Bella's best friend Jenna, who forgets all about her fiance working on an offshore oil rig to save up money for their wedding. For being a Christian book, nothing was said about this blatant infidelity. I guess we were supposed to assume that nothing but heavy flirting and vomit inducing staring into baby blues occurred between these two love birds and that all was well when Jenna and Bubba told the offshore drilling boyfriend the truth over a pizza at the Rossi family pizza parlor. I could go on and on with the atrocities committed by the author as she tried to write an engaging and entertaining Christian novel. Instead, I'm going to end this review, walk away, let my blood pressure go back down to normal, and thank God that I won't have to read any more of her books. I don't have time to waste in this crap. It's very poorly written with situations bordering the stupidity and the absurd (come on, choking in a restaurant to have a reason these two kiss, are u kidding me?). Besides I don't have any problem with christianity or anybody else's faith, but I do have a problem if they try to rub it in. Probably you can find the word "God" in this book more often than any character's name ¬¬I would recommend the author to read something by Cindy Martinusen-Coloma to learn how to write christian fiction without the reader noticing it. Subtlety is the key. Yes, this is a Christian novel. Yes, the mingling of cultures (Texan and Italian) is an interesting substory throughout the novel. I knew what I was in for when I started reading. Even though I knew what I signed on for, it didn't stop me from (literally) rolling my eyes during multiple points of this book. The story of Bella, an Italian-American wedding planner transplanted in Texas, falling in love with hertrue-blue Texas deejay, D.J., and trying to make it work in spite of the cultural differences they face is cute. I liked the novel...it was an easy, light-hearted read, and I enjoyed the way that it dealt with the concept of personal faith. I enjoyed its approach to personal relationships with God. It did, at times, feel a little overwrought, but that was fine.But that's about it. There is virtually no serious plot and no character development throughout. Every other chapter ends with Bella exhibiting the, "oh no, he's going to walk out of my life after THIS shenanigan" mentality. After the third time she waffled about DJ's commitment to her I was ready to walk away, but I kept reading. Overall, I enjoyed this novel on my kindle. I only read it because it was a free download, and having read it, I would have DEFINITELY been disappointed if I had paid for it. If you want something fluffy to read while sick in bed and woozy on antihistamines, this will do the trick. Looking for a solid romance/faith read? You can definitely find better out there. Of all the books I've read over the years, this one had the most influence of any other besides the Bible and I, Jedi!When I first opened this up, I thought to myself: Why am I reading this? Then, when I read the scene with the deejay/D.J. mix-up, this series had me hook, line, and sinker. I proceeded to read the rest of the trilogy, several other books by Janice Thompson, and other books in a similar vein, including Robin Jones Gunn's Sierra Jensen series!It all started with this book. This is a Christian book. You can't escape it - the references are all over the place, all the time. I don't mind that, but I do mind the realization that Christian fiction is apparently limited to Protestant faiths. The family is Italian - very Italian - and yet they all converted to Methodism years ago during a revival. Sorry, but that's just not realistic. Entire families of Catholic Italians do not just convert like that. I've known too many people of Italian heritage to buy that. When the heroine's sister makes a Catholic reference, the heroine quickly gasps, "But we're not Catholic! ", just to make sure the reader knows they're not. Apparently to be a Christian one must be of a certain faith. Catholics, Mormons and Orthodox faiths do not count. It seemed to me like the author wanted a wacky Italian family without the pesky baggage of an inconvenient religion. Apart from that, the story was slow and rather boring. Several plot points did not make sense, and having a Texan named Bubba is just too cliched for words. I downloaded this as a freebie, but rest assured that I will soon want it on my bookshelf. If a book lands on my bookshelf, then it is there to stay.Some might think the family is ridiculous or that Bella is immature, but hey, a lot of us southern families are like that. We live life to the fullest; we are loud; we love immensely; and we love our Lord. We aren't called the Bible Belt for nothing!Thompson's book takes a fresh and absolutely hilarious approach to a transplanted Italian family in a southern Texas town. But it isn't too farfetched to see Italians and Cowboys together, I mean, hey, they make the best cowboy boots this side of Sunday --or case may be, this side of Texas.The cliches used in the book? Well, we are known for using them so it makes it believable. The riotous family? Ha! Sounds a lot like mine!The mix-up about deejay and D.J.? Yup, not surprising. And how the family just pulls him into the fold? Perfect!The Christian references: praying, singing, rehabilitating a dog and a parrot? Sounds like a normal life to me. As a Christian, it isn't unusual to talk like that. Faith defines those who truly walk His path.Fools Rush In is a great and awesome book to read. It kept me up well into the night laughing and giggling. I might have been able to guess what was going to happen next. Made it even more delightful to learn that I was correct in my assumption. This story had me turning the pages (or in this case, hitting the arrow key) as fast as I could! I look forward to reading more of Thompson's books. This is one book I will highly recommend! Review is below the image. Contemporary Romantic Comedy is the genre that author Janice Thompson's new series Weddings by Bella falls within and boy does she know how to write it well. "Fools Rush In", book #1 is a heart beating, goosebump raising, giggles under cover read. I was able to read this in less a day, which considering my teething, growth spurt experiencing, 3 month old daughter is quite the feat. *wink* Bella Rossi is a New Jersey Italian relocated with her whole family to the shores of Galveston, Texas and she never envisioned falling for a true to earth eastern Texan cowboy, but that might just be what God has in store. The pages of this novel are grin cracking fun. I was amused by so many segments that I would re-read them aloud to my husband. If you are in the mood with something contemporary with a romantic pulse and an under your breath chuckling in the corner of the bookstore comedy then I suggest you pick up this story immediately. Within the first few pages you'll have a taste and know what type of book is in store and that's not even to mention the delving into yourself spiritual elements as well to boot! Wow. Very, very bad. And it's a shame too because it has a nice premise.The problem here for me was that the author tried too hard to be funny all the time, in almost very page. This tried to be a sort of My Big Fat Greek Wedding, but with cowboys and Italians. However, it failed. It's supposed to be a romantic comedy, but the author should be aware that less is more. She had everything (and be advised, there may be a few SPOILERS ahead):Main characters meeting based on a dumb misunderstanding: check.Someone fainting over a silly and supposedly funny thing: it has two.A fouled mouth parrot that the relatives try to convert (with sermons and the Bible on tape nonetheless): check.A jealous metrosexual ex: check.A few comical sisters in the faith: check.Relatives dressed as the Statue of Liberty and Uncle Sam: check.Feuding relatives that actually have feelings for each other: check.Misunderstanding over a simple eBay sale: check.Misunderstanding over many, many things: a thousand times check.Th main character, Bella, is 29 years old and very immature. She acts like a teenager, as well as her best friend. She contradicts herself and her feelings page after page. The thing with the ex-boyfriend is idiotic and her love interest is bland. The author feels the need to repeat herself a few too many times when translating Italian phrases and mentioning legal phrases, when giving the specials of Uncle Laz's restaurant, when stating that Bella has never worn cowboy boots nor listened to country music... You know, you don't have to beat us over the head with this, we got it the first time.There are many things that I am forgetting that I didn't like but I think I've been pretty clear. Finally, I give this 1 1/2 stars, really, because I actually laughed 3 (and I counted) times and enjoyed a few (very few) moments between Bella and DJ, the cowboy. I really want to like this book. It is a clean, Christian-based book but there were so many underdeveloped and inconsistent parts to the story that it drove me crazy. I wasn't even sure at first who the main love-interest was because the description of him made him sound too much like a backwoods yokel so it was hard to picture her falling in love with him. The ex-boyfriend sometimes sounded decent and in the next scene sounded like a crazed maniac. The story was being developed to have the sister admit she's been in love with the ex-boyfriend for a long time. Then after that part of the story was explored for a bit, in one sentence it basically says that she realized she wasn't really in love with him and it was dropped. Then later it says the sister hasn't been around lately because of some new love interest so you think it's going to explain that more but then the story was over. There were so many little things like that so I had a hard time liking this book. 1 1/2 stars. Reminiscent of the film Return to Me, this book wants to capitalize on the charm of mixing ethnic eccentricities, though in this case it is Italian/Texan rather than Italian/Irish. It's somewhat entertaining and the writing is executed with a light touch. However, that's also a problem: it's too light a touch. This story skims on a surface, even inexplicably building up to scenes then skipping the pay-off (e.g., a dramatic confrontation in a public restaurant between a lovey new couple and an ex). I'm not even sure what the story wants to be. A romance? Usually the couple has an obstacle or two to overcome. Here the protagonists fall for each other (one literally...*groan*) and then they are together. Um, OK. Career girl chick lit? The main character is trying out a new level of responsibility, but none of the mishaps are either significant or part of her learning curve -- it's all just due to kooky family members in increasingly outlandish slapstick but with no real consequences. And what's with the budget beauty tips thrown in near the end? Odd. This was one of the books I picked up for free on my nook, and I'm starting see a trend in the books that are free. Namely, I don't like them.This book has a lot of problems. For one thing, the main plot, the wedding that Bella is planning, ends a good 30 pages before the end of the book. Now, I could understand having some sort of wrap-up chapter, but the wrap-up in this book drags on for far too long. It doesn't help that there is very little conflict to begin with. In the case of a romance, readers are supposed to be concerned about whether or not the hero and heroine get together. In this book, they seem to be together from the very beginning, and the only conflict arises from Bella thinking that D.J. is going to be turned off by her family for the fiftieth time. It's kind of hard to like her when all she thinks about is her self doubts and how God is going to pull her through. We get it, she's insecure about relationships and she turns to God to help her. We don't need to be reminded about it every other page. The main character needs to have a bit more of a personality than that.It doesn't help that none of the characters are very likeable. For being a Christian romance, so many of the characters are shallow and focus primarily on their looks. Bella's mother, for instance, who can't leave her bathroom in the morning until she's wearing twenty layers of make-up. Or Jenna, who seems to fall in love with Bubba solely based on his good looks while her poor boyfriend is offshore trying to earn enough money to propose. Not to mention poor Rosa, who is considered to be the black sheep because she is not pretty enough, but that's okay because she's a good cook. Really? If you are not attractive in this book, you better have some amazing talent hidden up your sleeve. Actually, you need to have both in order to be considered important in this book. Like Bubba, who is both handsome and a good cook. Or D.J., who has an amazing voice. Oh, that's right, so does Bubba. If it wasn't obvious enough in the narrative that the books is obsessed with physical appearance, there's a segment in the end that is dedicated completely to beauty tips.Oh, and speaking of Bubba and Jenna... Jenna is Bella's best friend. They're so close, they're almost like sisters. So obviously, God intended for them to fall in love with brothers so they could legally be sisters. Seriously. It's right there in the text, that while Jenna's poor offshore boyfriend is struggling to give her the wedding she deserves, Jenna is off falling in love with Bubba because He wanted Jenna and Bubba to be together.Oh, and her relatives think someone has died every time they faint (which happens a lot, you think they would be used to it), and there's some subplot about her uncle reforming a bird so the bird can go and preach to his own lost owner. Throw it all together and you have a book that fails to entertain. This book was a huge let down. The author was inconsistent, the details seemed very inaccurate. How can a family who has lived in Texas for at least 15 years not be familiar at all with the Country/Western stuff? I am not saying all Texans enjoy country music, but it seems like everyone has heard of most of the big Country stars, or the Grand Ole Opry. And there were lots of details that were repeated over and over again, like the Italian phrase & it's meaning. Another reviewer has already commented on the slightly unbelievable idea that the whole family of Italian Catholics converted to the Methodist Church after one revival meeting. Even if that is the case I feel like the author went overboard on the religious stuff, mainly because it wasn't as relevent to the story, and almost seemed like filler. She spent a good page at least talking about making a list of things to give to God, then commented on it with remarks like 'God probably doesn't care about my brothers not putting the toilet seat down', all to lead into getting a phone call.My favorite subplot of the story was that of Rosa and Laz. What I hated about it was that the author wrote the book in first-person POV, but then had the main character be so dense that she didn't see the romantic tension between the two, Bella had to have it spelled out to her by her mom--when it was obvious to the reader, at least to me, that something was going on there several chapters prior. And this subplot was never really developed, I think there was more time talking about saving the bird. Something else that really bothered me was the entire chapter of "coincidences". A coincidence is something that seems like it was arranged or on purpose but accidental, like say I work on the weekends and always miss out on fun stuff, the power goes out so I get a Saturday off and 10 minutes later my friend texts to say she is bummed that someone cancelled on her and she will have to go to a concert alone, since I am at work. I'm not at work, I can go. Someone calling to set up a medieval wedding, because the ad says the place specializes in medieval weddings, is not a really a coincidence-Bella worded the ad knowing that she had never before set up that style of wedding. The majority of this chapter was used to randomly set up a couple subplots, and to work as filler in my opinion.I don't plan on reading the rest of the series, it was hard enough getting through the first book. Bella Rossi and her loud, boisterous Italian family run a couple of connected businesses – Bella’s Weddings (a/k/a Club Wed) is a reception hall and wedding planning service owned by Bella’s parents. Her uncle Lou owns a nearby restaurant – Parma John’s – and catering business. Now, at age 29 and still single, Bella is in a near panic at the thought of planning her first “theme” wedding. Her parents want to retire and have turned over the business to her. Problem is she has never planned a theme wedding before and she has less than two weeks left to put on a Boot-Scootin’ Texas wedding. This is a cute premise, and I had no illusions that this would be anything but light, romantic comedy, with Christian overtones. But, oh, my stars! Thompson drags out every cliché of the romance / chick lit genre. She uses and overuses the same tired phrases. Did I mention that Bella has never planned a theme wedding before? Are you sure I mentioned that this is the first theme wedding she’s planned? Because it’s important that you know this is the first time she’s planned a theme wedding. Seriously, Thompson tells us this at least four times in the first 30 pages. There are other repetitions, but you get the point. In addition to the stereotypical characters (Italian aunt who lives to make great meals and feed the world, an Italian ex-boyfriend with a hair-trigger temper, a pair of handsome cowboys with hearts of gold, an uncle with mob connections back in New Jersey, etc), she also includes two “cute” pets – a ferocious Yorkie-Poo named Precious, and a bedraggled parrot with a foul mouth. Her plot totally gets away from her, as well. This is padded to an excruciating 325 pages. The key first-time wedding is over and there are still 100 pages of fill to get through. A good editor would have trimmed this to fewer than 200 pages. A better editor would have trashed it and told her to start over.So why do I give it even 1 star? It’s a fast read. And I liked the basic premise. It’s actually book one of a series, though I’m not going to read any more. Um, ok. . . wow.So, this book was billed to me as a romantic comedy, and since I love rom/com with a wedding theme I thought I'd love it. Well, they fail to mention this is book is also Christian fiction, aggressively so.I personally have nothing against Christian fiction, I've read several novels for the genre in the past that I've really enjoyed. However, in order for it to work and be good you've got to tell a good story. Don't spend every third line telling me about God's grace and how Jesus loves me (and the dog and the bird, really?? ), tell me a story and then show me how God's grace works through the characters.This novel was also lacking in conflict. What was there was over-inflated and came off fake. Choking at dinner before a first kiss? Ex-boyfriend randomly taking his aggression out on current boyfriend's brother? Not buying that. We knew from the beginning the boy and the girl where going to end up together, you could have thrown in some more conflict to make us wonder about that. Having Bella worry about it is not enough, little less talk/feel and a little more action please!Some real drama, real emotion, or more realistic characters would have helped. But honestly, toning back the religion-pushing agenda would have gone a long way.Again, nothing against Christians or this type of fiction. But this book was bland. Pushing scripture 3-4 times a chapter doesn't make me want to turn to God. It makes me want to put the novel down and not pick it up again. The 'saving grace' so to speak here is that this was a free download, so at least I didn't pay anything for it! This was okay. There are a lot of people to keep track of. And they are a loud opinionated group. Christians, definitely, but a lot of stuff happens in a very short period of time, and it just made me tired.I did like the interactions between Bella and DJ, but there weren't enough. If I could give this 1.5 stars, I would. I'm halfway between "didn't like it" and "it was okay. "It's sad, because my father is a full-blooded Italian from an eccentric family, my mother is a Texan from an eccentric family, and I am a devout Christian. With that in mind, this book ought to be perfect for me: An eccentric Italian-American family moves to Texas and mixes with an eccentric southern family, and the main character has to lean on her faith in God to get through all the little dilemmas that pop up.Unfortunately, I could not find my niche in this book.At first, it reminded me of a cross between an early Shania Twain music video and My Big Fat Greek Wedding, and I was enjoying myself. As the story progressed, though, I found far too many stereotypes (and I mean stereotypes) for my liking: Yes, Italians tend to enjoy Sinatra and Martin, but it's not ALL they can think about! The Christian elements seemed forced, too. In fact, the book often went out of its way to make Christians look like fanatical nutballs (believing that buying anointing oil from a TV infomercial can help a parrot who learned swear words find God, or believing that because someone fainted, she needs to be literally resurrected from the dead).I might have been able to look past this if the main character was somewhat identifiable, but I couldn't get close to her at all. She felt as flat as the ensemble characters. She was so goody-goody it even annoyed me, a well-known goody-goody. She also severely over analyzed every tiny situation so much that I had to put the book down a few times, on the verge of getting a headache.Even the writing style couldn't win me over. In addition to the overabundance of similes was an overuse of specific phrases. I'm not kidding - characters' "eyes filled with tears" at least twice in every single chapter.I hate to have to report such a negative reaction to the book, as I was really hoping to enjoy it, but I couldn't get into it. I gave it two stars as opposed to one, though, because overall, I've read far worse books than this, and the book itself could have been much worse. I couldn't decide on whether this book should get 4 stars or 3. I finally decided on the 3 because although I went into this book knowing it was a Christian Fiction. I felt it went on about praying to God unnecessarily. Don't get me wrong I don't have a problem with religion, Even though I myself am an atheist, I often enjoy reading Christian Fiction. To see how people have faith. At times i'm even a little jealous, wishing I could have that faith/belief. Anyway as I was saying it just seemed to go on way too much. I loved the Characters and the storyline. But I also found it had a few bits where the author missed things. For example there was a bit where the love interest "DJ" rang the main character "Bella" and said he'd left a Long message on the answering machine. Bella went on to narrate "If the message is anything like the phone call I can't wait to hear it. I'll go there straight after hanging up." (or something along those lines.) then thats where the author left us. We never got to read what the message said. I found a lot of other times were the author did the same things she was painting a way to a great scene, I'd turn the page and I'd be left thinking "What the....?" staring at a new chapter stating that it was now two days later. The biggest disappointment was the fact that DJ didn't propose. I'd been reading thinking he's gonna do it now, it didn't happen. i'd get a few more pages on and think 'oh here it is.' But no still no proposal. I know its a series and I guess it will happen in one of the next books but i think it bugged me too much to bother reading anymore in the series. I tried to like this book, but that just didn't happen. The characters were completely unbelievable and cheesy. They fainted for no reason; I mean there was no conflict in this entire book and they were passing out and overreacting about almost everything.Then there was the writing.... I didn't know that it was possible to speak cliche; however, these characters think and speak in the tritest language. Cheesy, cheesy, cheesy. Tries to be funny, but it's really just ridiculous. A bit too preachy. Boring romantic lead. Ditzy heroine (cannot stand these). With just one of the problems I could have persevered and finished, but all of them together equals a big, fat DNF. I read about 1/4 of this and bailed on it. I couldn't get past all the 'praise the Lord' for everything that happened. Not for me. When Bella Rossi was a child, her very Italian, New Jersey-based family relocated to Texas – Galveston to be exact – where her uncle opened an authentic pizzeria and her parents opened a wedding planning facility, named after her. Now she finds herself running the family business and attempting to expand the customer base by offering exclusive, elaborately themed weddings. Only with her first big booking for a “boot-scootin’ wedding,” Bella may have gotten in way over her head. Coming from a family rich with an appreciation for Italian cuisine and fanatical about the music of Frank Sinatra, Dean Martin, and Andrea Bocelli, country music and Texas-style barbeque are outside the realm of her expertise, to say the least. Bella’s salvation comes from an unexpected quarter – a gorgeous, blue-eyed, very country cowboy named D.J. who, after a comic misunderstanding involving his name, finds himself knee-deep in Rossi family shenanigans and Bella’s attempts to prove she’s a capable businesswoman.I absolutely love pop standards, so when I heard about a novel named after one of the classics by Johnny Mercer, I was immediately intrigued. Of course in my view, Frank Sinatra’s version is the winner – so I found myself STRONGLY identifying with Bella’s Aunt Rosa in regards to her fanatical Sinatra appreciation. Bella and her family’s love for classic pop singers is just one of the novel’s charming points; in fact, each chapter bears the name of a classic song, and seeing how the title ties to the chapter content is quite fun. Fools also features one of the quirkiest, most likable casts of characters you’d care to meet – think My Big Fat Greek Wedding’s family dynamics with a healthy dose of Return to Me’s Italian flavor. There’s one aspect of Bella’s life that I’d love to see better drawn in subsequent books. Having read one or two other wedding-themed novels in recent months, I went into this book expecting greater detail about the “nuts and bolts” aspect of Bella’s wedding planning business. I had a little trouble buying the fact that Bella was basically planning her first “make it or break it” event in about two weeks time. So professionally speaking she comes across as a little, um, slapdash, though well-meaning. However, given the offbeat, quirky tone of the book I was able to ultimately set aside that qualm relatively quickly.With her first “Weddings by Bella” novel, Thompson has delivered a fast-paced, breezy read that’s quite simply one of the most enjoyable books I’ve read in recent memory. I can’t remember the last time I’ve smiled so much when reading a book! After all, it’s a rare thing to come across a novel where the characters are as fanatical about Sinatra and pop standards as I am. The spiritual thread is also very well integrated into the storyline. Faith is such a natural extension of these characters’ lives that it never comes across as heavy-handed or too preachy. And D.J. – well, he’s one of the most adorable, swoon-worthy heroes EVER. Witnessing his Texas-country meets Italian culture shock is hilarious, but he handles it like a pro (I love cowboys…I just felt the need to throw that out there ;-)). I’m definitely looking forward to reading Bella and D.J.’s further adventures…if they ever get around to planning their own wedding, I can only imagine the Texas-Italian hilarity that will ensue! Book #2, Swinging On a Star, releases in January 2010.Side note: Kudos to the cover design team and publisher for finding the perfect character images for Bella and D.J. D.J. in particular exactly matches my mental image of him from reading the book - they absolutely nailed it! At first, I admit, this book intrigued me. I thought the blend of cultures was going to be interesting, and I also liked the tone of the book. Well, that quickly got annoying. I am not really sure if I should put spoiler alert on this because there is really nothing to spoil. Here's my list of grievances.1) The Italian/Cowboy thing. First of all, I think this book makes huge cultural stereotypes which are completely unnecessary in the modern world. This author should study Post-Modernism. The Italian family was so stereotypical, it was annoying. There were so many undeveloped characters and they stalled the plot rather than move it on. I get that they were supposed to be all "My Big Fat Greek Wedding"-ish, but they were flat. 2) The main character, Bella. Really? Bella? God, how stereotypical and unoriginal can you get? (oops, did I just use the Lord's name in vain?). Her insecurities drove me crazy. She's a 30 year old business owner (only because mommy and daddy gave it to her) who still lives in her parents home. No wonder she's insecure; she can't do anything on her own. I don't know a person on this earth who would not move out of that house in a heartbeat. Not only that, but she constantly is asking rhetorical questions (I will get to that later). She is constantly repeating herself "This is my first themed wedding" (correct me if I'm wrong, but isn't every wedding sort of a "themed" wedding with different colors etc.? If you've done weddings before, it really shouldn't be that different). She is around 30 but has the mental capacity of a teenager.3) The Christian thing. Yes, I had to say it. I have read Christian romance before and I have liked it. But this book is TOO much. Bella thinks that God speaks to her; she hears angels when fireworks go off. People burst out in spontaneous prayer to defuse a fight. I mean, it borders rediculousness.4) The Bird. Okay, really? These people are so "religion crazy" that they try to reform a bird? First of all, birds do not understand what they are saying; they repeat what they hear. So they try to make it "come to Christ". It's a BIRD. Not to mention but I have read another novel, Swim the Fly, where a bird swears, and that novel is actually funny (something this novel fell short on).5) The farcical tone/scenes. The book was an entire farcical episode which was trying to be funny but it was not. Bella choking on her steak during a first date and then DJ having to give her the Heimlich maneuver..LAME...DUMB....STUPID. The scene with the bird lifting Mr. Neeley's toupee....unoriginal. The whole novel was filled with scenes which were supposed to be funny, but they fell far short.6) The rhetorical questions. "Really? Should I read this book or not?" (NO!) The use of rhetorical questions made the character completely neurotic and insecure. At one point she asks if she can really put a hat on. "Can I do this? Can I really put on a hat?" Seriously?? She constantly asks questions that she has just answered. When she says DJ's eyes are full of love, she then asks herself "can he really love me and my wacky family? "....Um, I think you answered that with your previous statement that his eyes were full of love. Stop doubting yourself and everyone around you. You are uninteresting. Bella Rossi may be nearing thirty, but her life is just starting to get interesting. When her Italian-turned-Texan parents hand over the family wedding planning business, Bella is determined not to let them down. She quickly books a "Boot Scoot'n" wedding that would make any Texan proud. There's only one catch--she's a country music numbskull because her family only listens to Frank Sinatra and Dean Martin. Where will she find a DJ on such short notice who knows his Alan Jackson from his Keith Urban?When a misunderstanding leads her to the DJ (and man) of her dreams, things start falling into place. But with a family like hers, nothing is guaranteed. Can the perfect Texan wedding survive a pizza-making uncle with mob ties, an aunt who is a lawsuit waiting to happen, and a massive delivery of 80 cowboy boots? And will Bella ever get to plan her own wedding?Book one in the Weddings by Bella series, Fools Rush In is fun, fresh, and full of surprises. Readers will love the flavorful combination of Italian and Tex-Mex, and the hilarity that ensues when cultures clash.Fools Rush In happens to be one of those books that I wish I could have lived in. The characters were fun, entertaining and brought many a smile to my face as I read. I wish I could have been adopted by the Rossi family. Not only is their every meal time amazing, but their outlook on life, love, happiness and food had me hooked from the very beginning. I appreciated the picture that Ms Thompson painted with the characters and their lives and have to say that there were some amazing little quirks that made this book very special.Bella is a sweet heroine who has some lovely mannerisms. She really does come across as a friend we would all like to have. DJ our hero is a gorgeous cowboy with a heart of gold which shines through his every action. Our couple have some great characters in their families and their circle of friends, who pull the storyline along in a very engaging way. 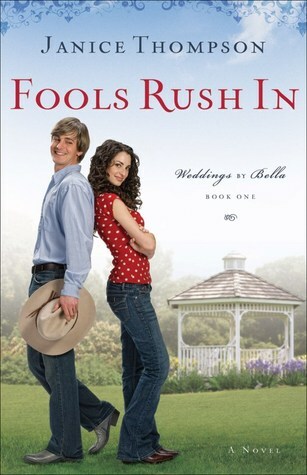 Even the animals in this story stand out as humorous.Fools Rush In is a sweet and funny romance with strong elements of Christianity in it. Church is very important to the people within the book and this really pulls the story together. Without this element I think the book would have missed some amazing scenes. I enjoyed this story because it pulled me into a whole new world of food, God and comedy; they made amazing companions in a book that had me entertained from beginning to end. Mama Mia, what a novel! I have never laughed so hard over a novel in my entire reading life!Bella Rossi doesn’t know what she has gotten herself into when she took over the family wedding planning service. Certainly not 800 boots, a deejay that isn’t a deejay- or is he?- her BBQ cook with singed eyebrows and one pesky neighbor who is always finding himself at the wrong end of her aunt’s broom.I heard great things about this novel, so I picked it up, though still a little skeptical if the humor could hold it’s own the entire novel- could it entertain me? Oh did it ever! This book went everywhere with me, becoming my best friend through the two days it took me to read it. I laughed the entire way through, I couldn’t stop smiling- even just thinking about it. I quickly become Bella’s best friend, she has such a unique voice and way of seeing the world, all through her Italian lifestyle. The food descriptions alone had my mouth watering! This family of quirky, lovable characters quickly worm their way into your heart and set up camp. What a wonderful family to escape to visit. I only wish they didn’t lurk between the pages of a book- then who says they have to? This book should be on everyone’s book shelf- it’s a keeper! In all fairness my rating of the book probably leans closer to a 3 star. It was a light, easy read that was fairly enjoyable in that way. It was interesting enough that I will probably, at some point, pick up books 2 and 3 of the series just to finish out the story line Thompson created. Bella Rossi is a transplanted Italian living in larger-than-life Texas. She's lived there almost her whole life but hasn't quite taken to the culture of Texas. Her entrepreneurial family runs a couple of successful businesses and Bella has just recently been tasked to take over the wedding event center that her parents had been running. She makes some switches and starts offering themed wedding packages - learning as she goes. As it goes with large families, and it seems especially with large Italian families, Bella gets plenty of help - solicited and unsolicited - as she forges her way. In the midst she wonders if she will ever get to plan her own wedding. A light, easy read perfect for mindless reading. It won't weigh you down thinking through plot lines but it won't inspire you much either. This book is written at the first person. Sometimes it can be a success, more often than not, it just reflects poor writing skills, as it seems easier to write thus. The vocabulary is poor, full of slang, the syntax bad; it's as if it supposed to look like the inner thinking of the heroine, but that did not work at all for me.Second thing : the heroine is almost 30. But her thinking, her expression and everything about her could be exactly the same, if she were 12 and this book were in the Young Adult section. The characters are all clichés with no depth. The plot is not great; some scenes are definitely exaggerated and turned into a farce but only for the eyes of the heroine - I never laughed and very seldom smiled reading this romantic comedy, which is a major failure.Last thing : the Christian proselytism was overwhelming and not convincing at all (hey God talked to this stupid and immature almost-30-wedding-planner).Another proof than Freebie reads are not all of top-notch quality. At least it helped me knowing this author should be avoided at all costs. Fun. This was simply a fun book to read. I don't normally love first person narrative, but Bella is terrific. Her voice is funny and poignant. Her family is typically Italian: loud, boisterous, involved and loving. She's given the family wedding-planning business and to make it her own, decides to host themed weddings. Her first one is a down-home cowboy wedding that threatens to take on a life of its own. But, God and family prevail and Bella finds not only herself, but a life of her own.I loved Bella and D.J. I loved her family and his family and the two coming together: the fiery, passionate Italians and the fiery passionate, Texans. You've gotta love them both! And, while it's a wee bit predictable and while everything wraps up neatly, it nevertheless is a charming, fun read. I read it in an evening, simply because I was enthralled and enjoying it so much. I can totally see this book on the screen. It would be a terrific chick-flick film. I can't wait for this series to continue.